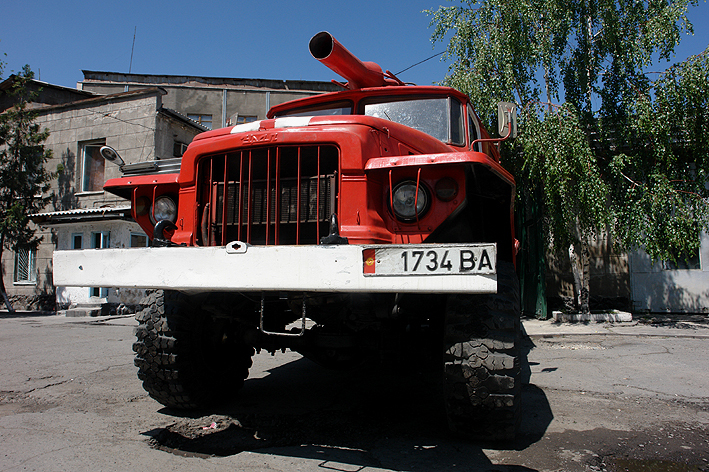 Kyrgyzstan May 2006, impressive front of the Ural pumper, Bishkek FD. Hey, J-T, this is one unique truck!! It seems that ony the Russian manufacturers put turret monitors like these on their fire trucks!Is this one a foam or a water cannon or both? With thanks from Tiger. P.S., you have lots of photos from Kyrgyzstan. Do you travel there often or just the once? Can you speak the language and what prompted you to travel there? Sorry if it looks like I'm a stalker or a predator or something, because I am not, it's just that I am thinking of travelling to Kyrgyzstan and you might be able to briefly tell me if it is worth the trip or not. With thanks, from Tiger. Added by Tiger on 08 April 2012. Mr van Hooft, is this a foam or a water tanker? It's a beast of a truck! Added by Tiger on 22 January 2013.